Most of us don't seek advice or reach out to others for help very easily. In part, it's because we're conditioned to see life as an individual endeavor rather than a team sport. Or because we believe that asking for help makes us look weak or incapable. We regard self-help as by-yourself-help. News flash: no one in the history of the world has ever achieved any level of happiness or success totally by themselves. In his 1976 book The Long Run Solution, Joe Henderson suggested that becoming truly accomplished at running (or at anything) doesn't typically require us to perform superhuman feats. In fact, success is frequently realized by those who simply do the things anyone can do that most of us never will. 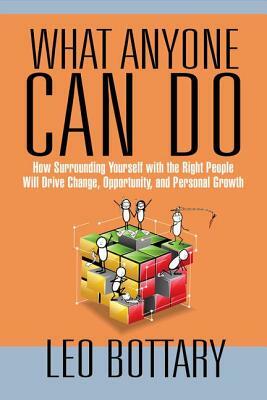 In What Anyone Can Do, with the help of Leo Bottary's Year of the Peer podcasts guests (and playful illustrations by Ryan Foland), you'll discover that if you surround yourself with the right people, you'll do the things anyone can do far more often. And when you do that, you and the people around you will realize more of what you want out of business and life. It's that simple. The Power of Peers (2016) made a strong case for how and why formal peer groups are so effective. This book steps outside the formal peer group arena to examine all the important relationships we have in our lives (parents, teachers, spouses, mentors, children, mentees, etc.) and provides a practical approach and specific framework for harnessing their power for your benefit (and theirs). It's what anyone can do. You're anyone, right? Leo Bottary -- author Leo Bottary is an author, keynote speaker, and workshop facilitator on the topic of developing "peer advantage" for high performing teams and peer groups. During a six-year tenure at Vistage Worldwide, Leo led the rebranding of the company and directed a thought leadership initiative on the power of peers, which resulted in a book he coauthored with Leon Shapiro titled: The Power of Peers: How the Company You Keep Drives Leadership, Growth & Success (2016). Leo also serves as an instructor for Rutgers and Northeastern universities. Prior to that, he was an adjunct professor for Seton Hall University, where he led graduate-level online learning teams and on campus residencies. In April 2015, he was named adjunct teacher of the year for its College of Communication and the Arts. Earlier in his career, Leo served in senior leadership positions at Mullen and Hill & Knowlton, where he was also Director of Client Service for the US. In the mid-1990s, he founded a public relations agency that a leading industry trade publication hailed as a regional powerhouse, new media pioneer, and great place to work. Leo earned a BA from Jacksonville University, an MA in Strategic Communication and Leadership from Seton Hall University, and has completed his doctoral coursework at Northeastern University. Ryan Foland -- illustrator As Managing Partner of InfluenceTree, Ryan Foland helps executives harness the power of vulnerability and authenticity to build a better, more relatable, more profitable brand. Recognized by Inc. Magazine as a Top Youth Marketer and named a Top Personal Branding Expert by Entrepreneur Magazine, Ryan helps thought leaders create and syndicate content that reveals their whole self to drive differentiation, growth, and loyalty. His 3-1-3(R) Method empowers employees to express their value in relation to the company and gives leaders a way to translate complex business systems into language that's relatable for customers. Ryan highlights the expertise of people within companies as the core talent behind the corporate brand, which drives reputation, trust and more clients to their businesses. A student of keeping things simple and powerful, Ryan is also a stick figure artist. Starting as a personal challenge from Tony Robbins in 2015, Ryan creates daily stick figure drawings that both inspire and give insights of how to better communicate your personal brand. His unique drawings are very popular across social media and you can find them featured in children's books, business books, blogs, websites, news publications and more. Learn more about Ryan and the problems he solves by visiting ryanfoland.com.